Physicians and Medical Students will have the opportunity to share their thoughts, projects, and ideas that support physician well-being at the Annual Joy of Medicine Summit. Find out how to submit a presentation below. A lightning talk is a very short presentation lasting only a few minutes, given at a conference by a multitude of speakers. The goal of lightning talks is to articulate a topic in a quick, insightful, and clear manner. These concise and efficient talks are intended to grab the attention of the audience, convey key information, and allow for several presenters to share their ideas in a brief period of time. Presentations may be in a narrative format as well. 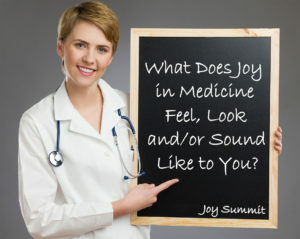 What Does Joy in Medicine Feel, Look and/or Sound Like to You? What inspired you to go to medical school to become a physician? How does your healthy lifestyle (diet, exercise, sleep) help you foster mental well-being? How do you seek out and accept help from others? What techniques or practices do you use to facilitate work/life balance? What does Joy of Medicine look like? Describe your vision for the future of medicine. What does your practice/organization do to foster physician well-being? What do you think practices/organizations should do to foster physician well-being? Make it quick —Presentations must be five minutes or less. Be creative —You can use slides or videos to present your talk. Hurry and sign up! —There are only 6 slots, so submit your presentation soon! Have fun! —This is your chance to share your passion for physician well-being. Lightning Grand Rounds submissions will be considered for in-person presentation at the Joy of Medicine Summit on September 28, 2019 and for inclusion on joyofmedicine.org and/or in the Medical Society’s publication SSV Medicine. Your full name, title, organization (if applicable), email address, and phone number. Your final Lightning Grand Rounds PowerPoint slides, or video. A brief description of your talk (500 characters or less).